Alarm clocks are thick on the ground on the Google Play Store, which is surprising in itself, since Android has a perfectly capable alarm clock built in. There are popular alternatives like DoubleTwist's slick-looking Alarm Clock, and various options for softly lulling you to sleep with music. Now there's a new option that's become quite popular on iOS (though we won't hold it against them), which uses your smartphone or tablet's sensors to wake you up at the right time. 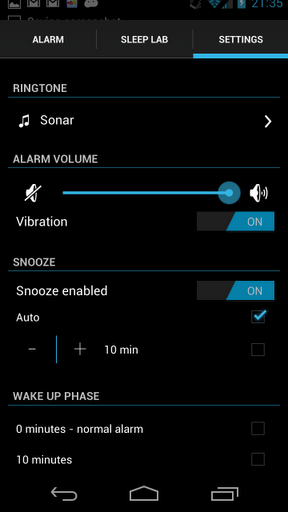 Sleep Time Alarm Clock is a free download, and it's compatible with just about everything out there. 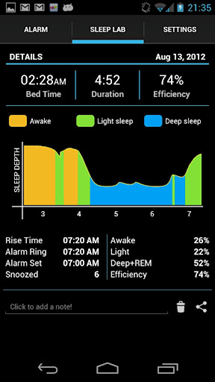 Sleep Time Alarm Clock uses cycles in your natural circadian rhythm to wake you up when you're most likely to feel refreshed, instead of set moment when you may be in your deepest sleep. This can make the difference between jumping out of bed or falling out of it. To detect when you're in your lightest cycle of sleep within a 30-minute wake up window, Sleep Time taps into your phone's accelerometer while sitting on your bed or beneath your pillow. Users who try this method have mixed results (I've never been able to get it to work for me), but there are plenty who swear by it. 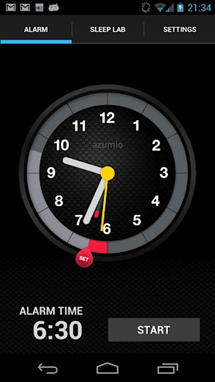 The app comes from Azumio, creators of the popular Instant Heart Rate. The app is undeniably beautiful, combining the subtle Holo theme with bright colors and animations. Setting the alarm itself is done in a novel fashion: just swipe your finger around the clock to set it. I must admit, it's a lot more intuitive than the native up/down arrows. After your first night of sleep, it'll even report on your sleep cycle for you. 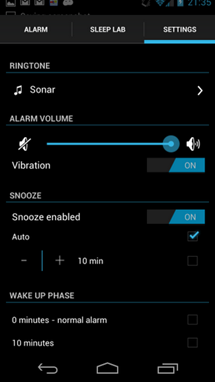 If you're looking for a new way to wake up (or just a pretty alternative to the default alarm), give Sleep Time Alarm Clock a try.